The first reported foal by Triple Crown hero American Pharoah was born at Brookdale Farm in Kentucky early on Tuesday morning. The new arrival, a colt, is the first foal out of the Tizway mare Kakadu, who is a half-sister to multiple Graded-winner Protonico and is from the family of Grade 1 scorer Wild Spirit. Fred Seitz jnr of Brookdale Farm, speaking to the Blood-Horse, said: "It's very exciting. For a first foal he's a very nice, very attractive type. Personality wise, I think he seems like he's going to take after his dad with that mellow-type personality. "Most babies are kind of skittish and want to run around behind their mother but he's not that type. You walk in the stall and he comes right up to you and starts chewing on your hand. He seems to be real bold and have that fun personality. He's what you look for if you're breeding thoroughbreds, I think." American Pharoah, a five-year-old son of Pioneerof The Nile, was trained by Bob Baffert to win nine races which included his famous Triple Crown heroics and signed off his racing career with a memorable victory in the Breeders' Cup Classic. Retired to stand at Coolmore's Kentucky base at Ashford Stud, he stood his first covering season in 2016 at a fee of $200,000. Among the first book of 208 mares he covered were Moyglare Stud Stakes heroine Maybe, Cherry Hinton, a half-sister to superstars Galileo and Sea The Stars, and Untouched Talent, the dam of Grade 1 hero Bodemeister. 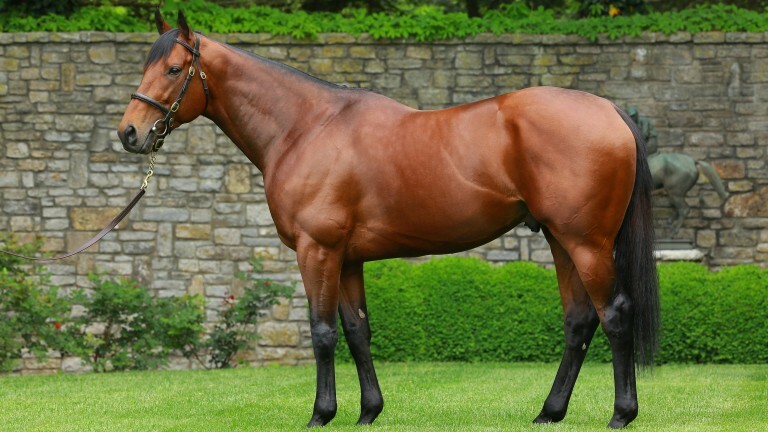 American Pharoah will stand the 2017 breeding season at a private fee.